Perhaps inspired by Mattel’s Monster High dolls, Hasbro has decided to capitalize further on the current high popularity for the long running My Little Pony franchise and extend it into dolls. There’s been plenty of online debate about whether this was a good idea, especially given the questionable realm that is adult My Little Pony fandom and the fact that a Google search for ‘pony girl’ should not be attempted by anyone under 18. Still, bizarre dolls are kind of a specialty of mine, so I had to have one. This is the deluxe (i.e. more expensive) Rainbow Dash. Your extra dollars get you a second outfit and bendable knees. Let’s take a look, shall we? The Equestria Girls live in a sort of mirror universe from the traditional My Little Ponies. First off, you’ll be glad to know that the requisite ‘cutie marks’ have been moved to the dolls’ faces, as opposed to their rears. Good move Hasbro. However, there are definitely some other poor decisions in this body design, which appears to be all new. The torso features a molded on bustier, which makes anything other than a crew neck top look odd. Although maybe that was the point? Worse, they decided to use a snap-on shoe design, which means the doll can never be barefoot and can never borrow shoes from any other doll line. Which is fine for adult collectors, but is going to be annoying for the six year old child who has lost the shoes. The body features a good range of poseability, especially for this small size- she has shoulder, elbow, hip, and knee joints. Her body is a sky blue color to match her pony alter ego. The face mold is really the draw for me on these dolls. They have a bright, open anime style face with enormous eyes, and little pony ears. 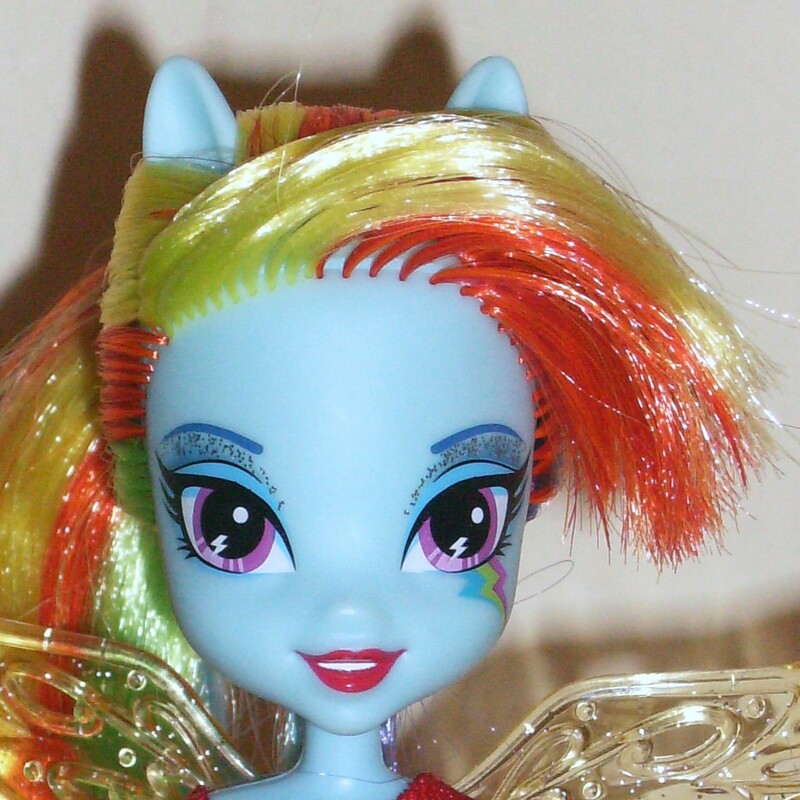 Rainbow Dash, of course, has a complete rainbow in her hair. The majority of her hair is styled in a loose ponytail (groan) while there are three long plugs left loose down her back in a separate tail. The pictures on the box make it seem like they were originally planning to have a rooted tail on her rump, but they apparently decided to skip that. The hair plugs are kind of sparse around the hairline, but the saran hair is thick enough that she has a nice full head of hair. The face paint here is very over the top- purple eyes with lightning bolt dashes, the rainbow bolts on one cheek, glittery eye shadow, blue eyebrows, and red lipstick. As far as outfits and accessories go, the quality here is very mixed. 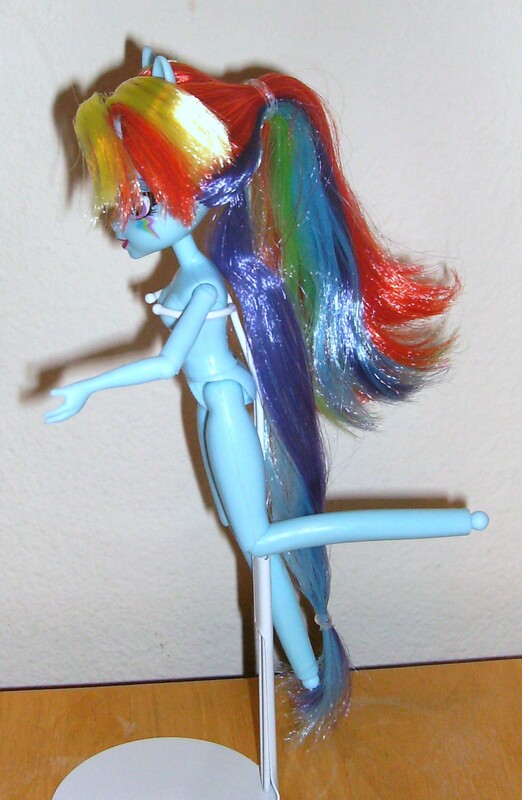 Rainbow Dash comes with two mini dresses in red and blue, both with rainbow insets. The blue dress is completely finished, but the bottom of the red dress is unhemmed. The red dress has little sky blue ponies over the rainbow print, which are also featured in the (again unhemmed) gauntlets. 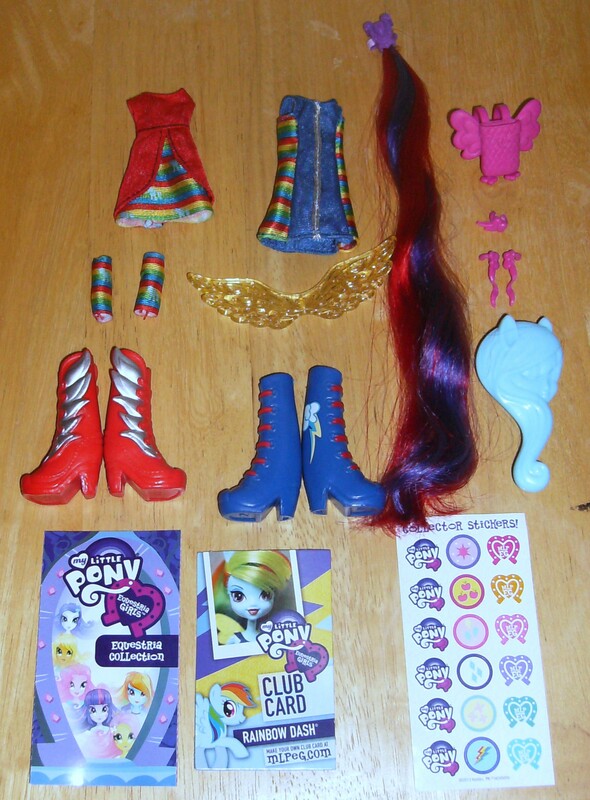 She has two pairs of boots, red with silver wings and blue with the full pony version cutie mark. She also has a pair of detachable wings for her back in clear gold with glitter. She also has a molded pink winged backpack, a pink bracelet showing the cutie mark and two pink plastic clips that I can’t for the life of me figure out what they’re for. Apparently neither could anyone else, because in all the promotional pictures I can find, they’re lying on the table ignored. <G> Stickers, a promotional brochure, and a Club Card/website ad are also included. Last but not least, there is a long clip in strand of red and purple ‘hair’ that can also be worn by a child, and a fancifully shaped hairbrush. 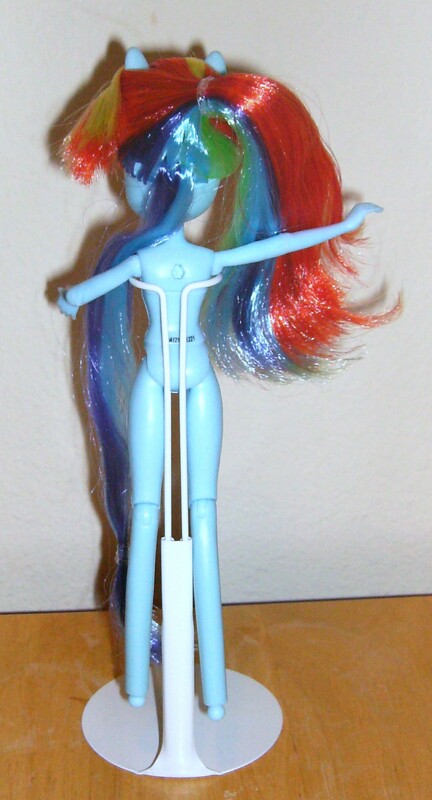 Redressing Rainbow Dash was a challenge- she’s far too short and skinny to wear almost anyone else’s clothes. 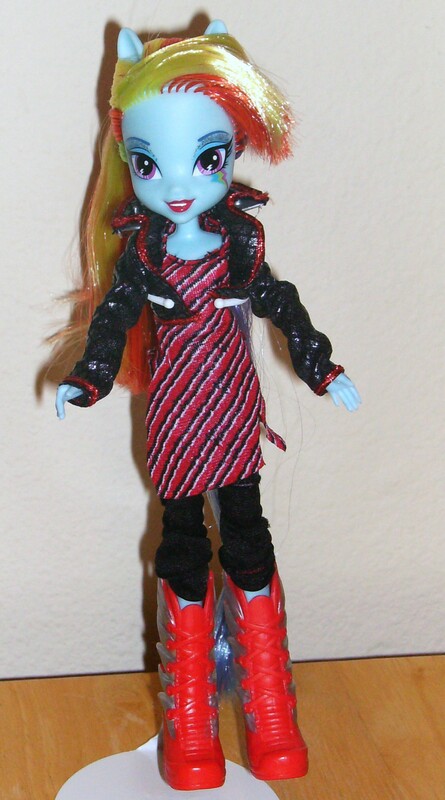 Finally, Monster High Torelei took pity on her and loaned her some clothes. As you can see, the jacket and pants bag on her, and Toralei’s blouse becomes a full dress for Ms. Dash. Originally Torelei felt that the MLP clothes were too juvenile for her, but eventually she decided that Rainbow’s red dress made a ‘purrfectly ironic’ baby doll top for her. Unfortunately, Rainbow Dash now follows Torelei around like any annoying younger sister- we’ll have to see how long her patience with her new friend lasts! I have to admit, the quirkiness of the Equestrian Girls really makes me smile. The overall quality is average for a child doll, but not really up to collectible standards. Since they’re not priced as collectibles, that’s not really a problem for me. If you, like me, go for a bit of whimsy in your collection, you should definitely pick up an example or two of these girls. Thanks to Nikki for suggesting that I try Bratz shoes on Rainbow Dash. 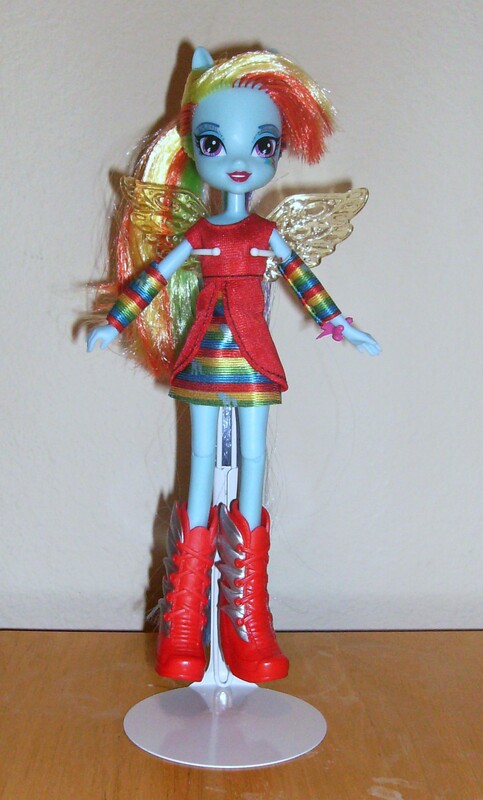 The Equestria Girls’ ankle post is larger than on the Bratz dolls, but they do go on with minimal effort. As seen in the photos below, the joints are designed differently so the Bratz shoes make her significantly taller as well! 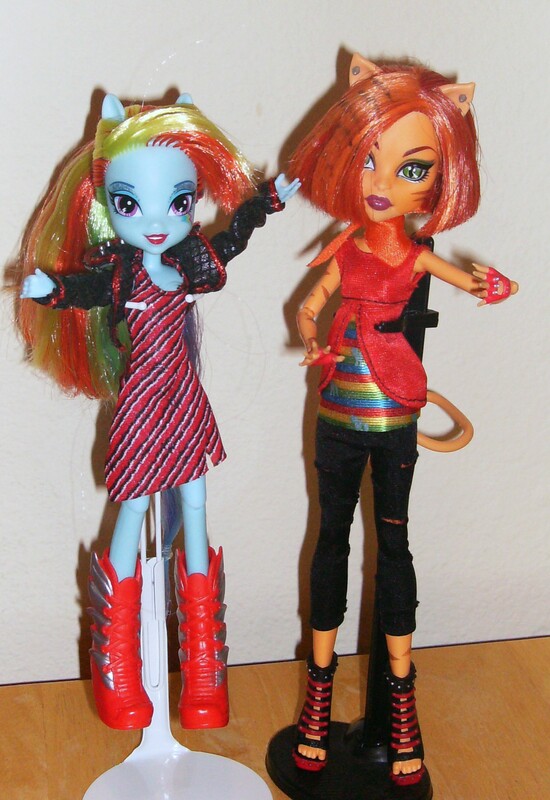 Do you think Rainbow Dash could wear Bratz shoes? The Bratz have similar snap-on shoes/feet, so if you can easily find Bratz shoes I’d give that a try. They do fit, but because Rainbow Dash’s legs are significantly skinnier it looks a bit odd depending on the shoes. I’l try to get some pictures up tomorrow. Cool. I’d love to see them! This week didn’t go as smoothly as I hoped, but the pictures are up now Nikki! My netbook’s power cord died, the battery on my backup laptop won’t hold a charge, and I’m having to borrow my dad’s computer until the replacement parts come in from Amazon, so the week hasn’t been so great for me either. I totally understand your delay. The pictures are awesome, and Rainbow Dash looks so cute in the furry white boots!